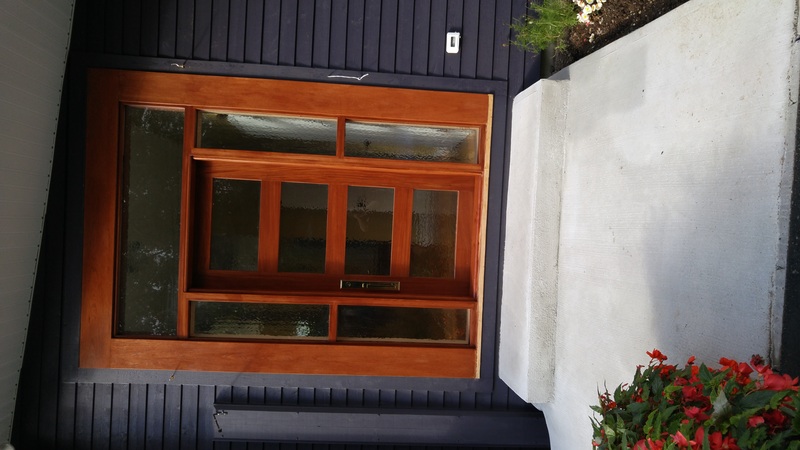 I built and installed a stave core exterior door with 3 panels just a month ago. It sits behind a storm door and faces South. It gets more sun exposure this time of year than in the Summer. Earlier this week the owner called and asked if I could stop by. When I got there he showed me where the veneer in the center panel had cracked, as shown in the photo. I found smaller cracks in all three panels. There were none when it was installed. I noted that the door was warm to the touch even though the outside temp. was about 10F. He said he heard a serious of cracking noises the night before. This was the coldest night of the year so far at about 6F. I built the floating panels using a center core of 3/4" BB plywood and 3/16" veneer on both faces. Clearly there was stress in the panel or the veneer would not have split. The veneer on the inside is fine. The panels are captured in the frame - something I'll never do again on an exterior door. I think I know how I can remove and replace the panels next Spring. What I'm looking for here is your opinion as to what caused the cracks and what approach to use with the new panels to make sure it doesn't happen again. Removing the storm door would help but probably not something the homeowner would do. Thanks. Somehow I can never post more than one picture. So here's one of the crack that didn't post the first time. Can never get them to post with the correct orientation either. Am I really that dense? I’m not an expert, but the first problem I see is the storm door is causing a greenhouse with the dark colored door behind it. What kind of glue did you use? Not sure if it would have helped here, but when I do exterior doors, I make two panels per opening, prefinish them before installing them, and sandwich a piece of waxed paper between them. This helps to let the outside panel move differently than the inside one. 3/16" is not veneer, it's lumber. There is no room for shrinkage since you glued it to plywood. I was taught that 3/32" could be the maximum thickness to act like veneer. Rich is correct to a point. The reason one side is cracked and not the other is because the panel is cupped. The movement put the interior wood thick layer into compression the exterior into tension. The massive temperature differential between the interior caused the movement. Higher temp caused the interior thick layer to shrink and the outside wanted to do the opposite because of the extra cold dew point. My shop we have a solar panel be surprised how much heat builds up even on the coldest days . Thanks for the replies. Most exterior wood doors I've looked at have 3/16" veneer on the stiles. So far there have been no issues with the veneer on the stiles of this door (nor any other exterior door I've made), only on the panels. I used Weldwood Plastic Resin Glue to glue the veneer on; epoxy to glue up the frame. The crack was heard in the evening so temperature seems like the most likely culprit. The storm door is bad and may have played a contributing role, but I think the temperature differential was the larger factor. But plywood is really stable and temperature plays much less of a role in wood movement than moisture content, so it's still not obvious. What is obvious is that I will have to replace the panels next Spring. When I do that I will go with two back to back panels. The waxed paper between them is an interesting idea. I've seen others use aluminum foil. I'm not sure yet if I'll make composite panels or use solid stock. Thanks. More comments welcome and appreciated. I am puzzled by other shops desire to "veneer " with 3/16". It doesn't behave like veneer in that there is sufficient thickness to cause enough stress to act independently to the substrate. I have veneered with 1/16" before which is available commercially and would be the thickest I would want to work with. As to why your panels cracked, I think it was purely a moisture problem. Temperature was a factor only in that the colder the air gets the less moisture it can retain. The door exterior was exposed to desert air conditions. I've never seen a production door with 3/16" oak veneer on it. What are the staves made from? Plywood? You can't compare success on the staves and the panel unless they are identical substrates, both in thickness and material. You also can't compare other doors success with thick veneer unless they live in the same solar collector your customer has made with the storm door. When the conditions are tough, everything has to be made with huge safety factors in the engineering. By the way, who added all that white caulk and to the door and glass? Caulk comes in colors these days, right? All that caulk indicates that there must be other shrinkage problems since the caulk even goes over the joint of the window trim rail to the door stile? You are going to have a lot more issues with that door that just replacing panels in the spring. It's going to be a long range issue with finish and shrinkage issues. Hope you spelled out a warranty duration in your contract. The stiles are made from poplar stave cores. The rails have LVL stave cores. The white you are seeing isn't caulk as there is none. Not sure why it looks white around the glass but there is no caulk. There is no warranty on the door other than my own desire for it to be right. I warned the HO about the storm door and we agreed to try it. If it continues to be a problem after I replace the panels we'll have to remove it. It is almost guaranteed the high temp differential created between the doors is the main culprit. It has also to due with the glue used- moisture based or not, and how long it had to set before being put into service, along with differential moisture in the shop vs in the field. If the customer insists on a storm door, I insist on space below the storm, and no weatherstrip at the top- I do the sides to give a soft close to help with wind slam. This creates a vented chimney effect- pulling cooler air in the bottom and letting heated air out the top. Helps equalize or negate the heated chamber effect immensely. I also only do solid wood doors- no skins. Thanks Peter. I've thought about changing to a vented storm door, though I don't know if that's possible with this particular design. The HO did tell me he has a full length screen that substitutes for the glass panel. That would be easier than removing the storm door, but not too appealing visually. The panels were at least a month old before I installed the door. The EMC in my shop was 6-8%, likely on the lower side. WO has high seasonal movement and the panels were mostly plain sawn grain. If the stiles and rails make it through the Winter with no cracks then I will replace the panels next Spring with back to back panels and leave the storm door on. If the stiles and/or rails develop cracks then I'll replace the entire door and remove the storm door when I do. For those wondering and/or questioning why I used 3/16" veneer it's because the guy who taught me how to build doors uses that for his exterior doors (and 1/8" for interior doors). He's built hundreds and hundreds of them and shipped them all over the country. He claims he has had no failures BUT does specify no storm door may be used. He uses LVL stave cores for the stiles and generally solid wood for the rails. I typically use LVL for both, but switched to poplar for the stiles this time because I had it and didn't have a seasoned LVL beam. Personally, I think 3/16" is too thick, but I often read where people claim that veneer behaves like veneer up to 1/4". Of course, everything can be taken out of context and that observation may only apply to indoor applications, I don't know. But since he's had no failures who am I to argue having only built a handful of exterior doors. Given this learning opportunity, however, I think I'll implement the no storm doors rule in the future. I've got another exterior door facing due West into the sun, with no porch to protect it. So far that door is doing fine. I made it much the same way except it has back to back solid wood panels. I'll actually get a look at it on New Year's day. Well, Here are a few of my thoughts. There is a bit of grain runout in that panel, which allows a little faster moisture loss than out the side. Dr Wengert has mentioned on these forums that regardless of the ambient temperature, raising whatever it is by 25º will lower the AD lumber moisture content to KD levels, and I would suspect KD on down to oven dry. All swelling and shrinkage is due to MC gain or loss. Using QS or rift would have cut the propensity for movement by half. You keep justifying your 3/16 thick veneer by others using it for stave construction on their stiles and rails. You have had no problem with your stiles and rails. Your problem so far is a plywood panel with 3/16 veneer on both sides. I have not heard of anyone making a panel of that type. Think about the differences between bonding 3/16 to face sides of a vertical grain 1 7/8 x 3 1/2 perfectly flat lvl. Nothing like you thick veneer ply panel. In thickness, width or material. I don't think it is necessary to build paired panels with or without waxed paper between. In an attempt to build a stable panel you may have inadvertently caused problems for yourself and added to your work to boot. The door panels are not large. The expansion/contraction is predictable. Design for it. Oak is difficult to glue with 100 percent success. You can make them from rift oak without a glue joint I suspect. No veneer, no ply. Pre-finish and allow to float which you have designed for. Less work, no glue, what's not to like? Yes, the problem seems confined to the panels, thankfully, and I agree that using 3/16" veneer over plywood was poor judgement on my part. I'm pretty sure I'll use back to back solid panels when I replace them. Anyone have any advise on how to remove/replace the panels w/o changing the look of the door? I used the inset panels originally to get the nice clean look, rather than using applied moldings, and would like to maintain that if at all possible. Thanks. To maintain that exact look you need to take the entire door apart. You can get the old panels out by cutting and destroying it, but putting a new one back in is the issue. I'd make patterns of the correct size, and use a router and guide bushing to cut out enough material to remove the panel. Square up the corners with a chisel, put in the new panel, then apply a molding. Cut the panels free. Route the Dado shoulder away on the inside of the door. Replace with new panels and use mitred stop on the inside held with brass or copper nails. Artsy craftsy can look handsome. I see caulk on the door, but then you say it is not caulk. No caulk/sealant at the glass? Etched logo on the glass? Mill marks on the horizontal rail? Jagged edges on a vertical member near the rail? LVL (seasoned ) here, Poplar there, solid over there? Plywood core for the panel? I will politely ask you to consider your craftsmanship. Have you made doors before? One might say you cleaned shop with this project and got rid of the odd bits laying about. Or so it looks. I am certain you have a product in which you are comfortable and profitable, and this door is a favor, or an experiment or similar. The veneer that has split probably pulled the face ply off of the plywood. Is the Oak face glued to the plywood at 90 degrees to the plywood face? Did you consider balanced cross banding?Plywood bonds can be amazingly weak, especially in tension. When you replace the panel, be sure to examine that carefully. Replace the panels by working from the interior side and clamping a straightedge for a laminate trimmer with a 1/2" bearing over cutter bit. Cutter should be about 3/8" long. Set the cutter so one edge is at the panel opening groove, and the cutter is cutting about 1/8" deep. Make the cut and drop it down until you are just kissing the defective panel. Square up the corners with a sharp chisel. Pop out the panel. Replace it at the same thickness or so, and make stops that will stop short of coming up flush to the face of the stile/rail about 1/8". Bore and nail these in place. If you like, put some caulk in the panel groove, forcing it into gaps as the stops go in place. A good weatherproofing for a door in weather. Did you not do this for the glass panels? Glass goes in after assembly, with stops? I will also suggest you put a good grade of colored silicone (RTV) around the glass to wood joint on the exterior side. Let it squeeze out, and knife it off 48 hrs later. Do the same on the inside stops if you value your craft. Dark Brown, Bronze or even Black will work. I suggest, again as politely as I can, that you go back to the fundamentals of door craft. Solid wood, mortise and tenon, cope and stick joinery. Floating panels of solid wood. Requires a proper joiner, a decent planer, a mortiser of some sort, a tuned up tablesaw, a solid shaper capable of making cuts in white oak that are the full thickness of the door. You will also need a good R/O sander. Leave the LVL for the framers. White Oak is not so expensive that you cannot use it for the entire door and then you don't have all those different materials and thicknesses, and pressing and joining, etc. If your stiles are not perfect, take a good piece of Oak and resaw it to 1/8" and face them with it. Keep it simple. M&T is much simpler that a loose tenon. Easier to make, as it is only two parts, not three. Easier to lay out since the equipment does that for you when set up. Sticking - edge profile - has a reason in that it helps drain water. A surface 90 degrees to the face withhold water, aging the finish and working its way into places you do not want it to go. A coped and stuck mortise and tenon will prevent the intrusion of water, not invite it. The photos are of coped and stuck mortise and tenon joinery. You can visualize how panels float and glass is stopped in with such a design. I hadn't even noticed the poplar stave core for the stiles. lvl for the rails. First. It is not necessary to use engineered wood for doors. Solid has been working for ever. Second. If you choose to stave core, you need to choose a stave material. Ideally the stave should be the same wood. If not then a different would with the same properties. Cherry door has maple staves. Some people then decided to use a generic stave. It was possible to get a lvl material that should remain straight and flat. Keep in mind this is not your typical lvl off of a construction site. Poplar is not a wood it is a weed. It grows like a weed. It moves around like a weed. Some of it even looks like a weed. We use poplar for only things that don't really matter. Trim. Miles of trim. 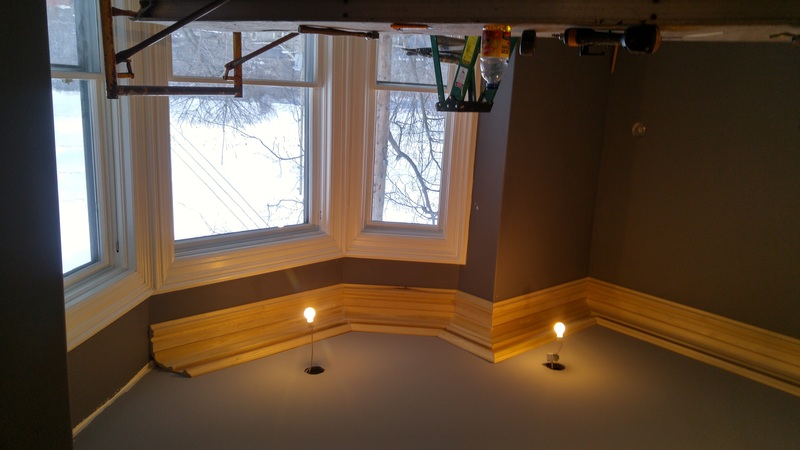 Wainscoting with glued in mdf panels. No cabinetry. No doors. If I had to build a small number of stave construction doors I would use vertical grain cedar for the stave core. It will not move. Glue 1/4 veneers on all edges. If I had to veneer a flat panel it would be 1/8" veneers bonded to a sheet of Extira exterior mdf. I would glue it up then run the whole panel thru the wide belt to flatten it. Only use epoxy for everything. Well that was interesting. David, you are seeing caulking where none exists, and defects where there are none. Why the criticism for using engineered construction, both you and others, when there are no problems with the stiles or rails? If you prefer to build with solid stock, that's fine by me. It takes a lot more work to build stave core construction than to use solid wood. But it's a proven method and one I feel is more stable, so I use it because I prefer engineered solutions and conservation of materials. The comment about poplar being a weed was good. Too bad no one warned those guys in the 1700 and 1800''s in Newport and Philadelphia who made the finest furniture ever made in America not to use it. Oh John, you might want to search through David's previous posts on door making. I was waiting for his response with some trepidation. I think his experience speaks volumes. While there have been no failures with your rails and stiles, an argument can be made that you have way more glue joints throughout the build that are a source of labour and potential joint failure. Doors have been made for centuries, some lasting for centuries, using tried and true methods. We have available to us better machinery and more controlled wood seasoning so we should be able to make stable, long lasting doors without resorting to "engineered " construction. I put engineered in quotes because doors made this way are designed for mass production with fast assembly and shipping with minimal cost not best construction principles. John, have you looked at the second picture you posted? And enlarged it? What is that white bead between the panel and stile if not caulk? The same white material in the split in question and that has separated from one side of the crack as well. You can see the mill marks on that piece of stock under the glass indicating that it was not sanded before finishing. perhaps we are talking about a different poplar. The poplar we get is green/white with a little purple now and again. It is not stable. It twists, cups, expands more than any of the typical hardwoods. Some people try to go cheap and make cabinet doors out of it. Then they realize its good for paint grade trim. They switch to soft maple and all is good. poplar is an awful core material. I don't mind engineered doors. But they have to be engineered. You have not done that correctly. Good luck with the stiles. Hopefully they won't go bad. You may be correct that they used poplar for furniture. However, it was old growth that was stable. The stuff we get now has 1/4" growth rings. old growth Eastern white pine used to be totally rot resistant. It might as well been cedar. Now it has no rot resistance what so ever. Things change. Must be some sort of reflection that makes it look white because there is no caulk. The only white in reality is the tempering etching on the glass, and the light colored separator between the glass panes. Doors have survived for hundreds of years using solid wood construction. Many twist and warp, too. It is primarily for that reason that the engineer in me decided to use composite construction. It has nothing to do with saving money. Far from it. It costs a lot more for me to build a door this way than if I used solid wood. I fully understand that a multi component construction offers other avenues for failure. I accept that risk for the benefits the Europeans have proven works. Time will tell whether my doors fair as well. Somehow, you all seem determined to convince me there is a problem with the frame when there is none. If there is a problem down the road, I'll be more than happy to tell you all about it. The problem I came to you with for advise relates to the panels. To those who offered advise as relates to those, thank you. John - Again, I mean no disrespect in my comments, past or future. You are probably feeling a bit beat up by now. You had the courage, the curiosity to seek help, and that speaks to good character. You are standing behind your work, and that is admirable also. Ours is a humbling profession that often attacks self confidence in such a way that I am regularly shaken to the core. I then begin to question my fundamentals, my craftsmanship, my process and sometimes, my sanity. I looked at the whole of your dilemma and not the specifics. Adam is correct about Poplar. It grows like corn in my area. Its most/only redeeming factor is its cost. However, just down the road is a preserved 1830's settlement that has Poplar all over the place. Log cabins almost 200 years old with Poplar logs, and no sign of decay. The difference is one of ring density and heartwood. That dark green dense color of old growth Poplar. It is difficult to count the rings in these logs as they are so close together. Ring density and heartwood in old growth lumber will prevent rot when it is very high. It will also produce extremely stable lumber that moves only a bit in service. Witness the hardwood sinker logs that are brought up going mostly toward the music instrument makers that recognize the tonal qualities of high ring density. The Keno brothers on Antiques Roadshow are quick to point out the Poplar secondary wood in older furniture, and how it helps establish the piece as old and authentic. While some reproducers of 18th Century furniture still use poplar, they insure it is old growth, with the required ring density for stability. "Engineered" stiles are not now, nor have they ever been "engineered". LVL will be in the same category. That is a marketer's word to help get around the fact that mass marketed doors are not solid wood. The origin is in the accountants. They wanted predictable process, with variables they controlled, pushing the skilled woodworker out of the process, and making it one that less skilled workers can perform. They might rather be called "accounted" stiles. There are some promising door core materials being made in Europe - actually engineered for door stiles. But they are not here yet, and with cost only being the deciding factor for most American buyers, may never have a place in the American market. Perhaps your visit to the door today will inform you better of the condition of the door, and in particular, the panel crack. I like solid wood because it is traditional, faster, and more authentic to the craft than stave built stiles. But, when needed, I will use stave built stiles for a door, but with a wood core, preferably the same species. Three stave built doors vs a few thousand with solid stiles, so very low percentages. Solid stile exterior doors have had issues in about 4-5 doors. One was owner caused, the rest due to wet wood or reaction wood that was not identified and set aside. I posed a lot of questions in my previous post. They are not rhetorical questions. Some are contextual, some specific. Had you written to me privately, I would ask the same questions. If you can provide answers, so can we. Have you made doors before? What is your core product range? Your experience? What type of joint is used for the rails and stiles? Is the Oak 3/16" face glued to the plywood at 90 degrees to the plywood face? Did you consider balanced cross banding? Did you use caulk/sealant at the glass panels? Glass goes in after assembly, with stops? Do you use a decent joiner? A shaper? Thanks for putting up with me/us. You have valid questions and a real problem. I think you have a path to a good fix, but you sure don't want to have this happen again. I will take issue with the statement that "Many (doors) twist and warp, too." Wood will warp or twist ONLY in respect to changes in its environment. In a very small minority of cases, it can happen due to reaction wood. This warping and twisting that is so prevalent (?) is a scientific process that is well understood - or should be. It is not voodoo. To make such a statement is to repeat the marketing irresponsibly used to damage the quality wood door industry. I will challenge anyone to provide real evidence of a wood door that warped or twisted after being in satisfactory service. 99 times out of hundred, if a door is judged "warped or twisted" it is the frame, the hanging or both. In our shop, the frame, fit and hang, hinges and weatherstrip cost about the same as the door. This does not include the trip to the site to explain to the carpenter how to really set a door. As you can see, I get pretty damn defensive about this subject. One thing working wood has taught me is that beliefs count for nothing. The proof is in the performance. It is science, not magic. I have the advantage (stubbornness?) of 50 years as a working professional, and investigator of what causes wood failures and successes. Not once can I say it always just "warps and twists". I think gluing 3/16" veneer to BB ply for panels is very risky. You are basically gluing solid wood to a substrate that has no movement. For these panels I would have used two solid wood panels back to back. The same goes for LVL and timber strand cores for stiles. With these you should keep the veneer 1/8" or less. I prefer solid wood stave cores. With these you can use thick veneer because the core moves as solid wood. Same species here is better. I prefer to build solid stiles and rails when I can. Door thickness, size and species will dictate when stave core is needed. The storm door is part of the problem. Agree that new poplar is night and day from the old. David, I have a question on your comment stating wood will only warp with changes in it environment. I live in northern Michigan, on Lake Michigan. We have weather from 90+ degrees and high humidity in the summer, to -30 degrees and super low humidity in the winter. Combine that with modern heating and cooling practices, I’d say that’s a pretty good change in environment, especially from one side of the door to the other. I’d love to build solid as you do, however that requires a good source of material that is very hard to come by in my neck of the woods. Most doors I build are 2 1/4” thick and 7’+ tall, and 42”+ wide. A lot of them face the lake. After having two doors fail, I switched to buying plainsawn oak lumber, ripping it up and face gluing it together to make a quarter sawn core, then skinning it with mahogany. I have never had a problem since. My question is does your (or anyone’s for that matter)location make it easier for you to build solid wood doors? I’m not an expert, and i want to learn the best ways to do things. It just seems with the lack of good material to work with, and the extreme weather variations, sometimes it would be better to do engineered door stiles and rails. Your thoughts? Engineered(manufactured) beams & posts are thought to be better structurally. Milling up a pile of 2x4 fingerjointing them together and then bricklaying to achieve a gluelam does not make it stronger...than a defect free piece of lumber. It makes it stronger than a piece of lumber with defects. Most every piece of manufactured beam or post has a wicked bow or crown. Often more than a stick of timber. Kind of hard to remove, because the glue is hard to mill. They have better things in Europe reminds me of some infomercial. Do I get a set of ginsu knives with those european door staves? I believe the skinning of door parts started because when large companies did the math, they could use 90% less face wood and still come out with a good product. They tooled up. Eventually they started using manufactured lvl type cores because their finger jointed knotty pine staves were failing. I've made piles of solid cherry doors with no problems. The problem is by the mid 90's we had cut all of the big cherry trees down. It was almost impossible to get a cherry 4x4 without sap wood. So you then you started to do things like face laminate 3 pieces of 3/4" solid together. Eventually that material all started to have sap wood or you are paying $$$. So the next move would have been stave cores. First all the defective cherry you've got laying around. Then something else. The better companies for example use maple staves skinned with cherry. This is a smart construction method. Ticks all of the boxes. I don't mean any offense to you or your construction methods. Woodweb is all about discussing the failures & success of our methods. We often learn more as a group discussing the short comings of one another. I've certainly made my own share of mistakes. Guys like David are generous to share careers worth of knowledge in order to help us learn. Many of us are passionate about our profession. However, we have learned to check our egos at the door of the ww. I should not throw all manufactured lumber in the same boat. lvl are definitely stronger than mostlumber the same size(because of grain and knots) . Obviously you can get them longer. It does not make them more stable. We are not talking about framing strengths. The innate dimensional stability of a core material firstly is the question. The second is the compatibility of the core with the skin. Using typical solid stock for staves is different than using lvl or plywood or timber strand as a core. You are building a composite part when combining dissimilar materials. Kinda like using cedar as a core and skinning it with fiberglass. Its a good technique; however, you need to understand how it works. What does your mentor have to say about the situation? The person who says he has made thousands of doors from framing lumber and epoxy, and has been telling others to do the same for years, should step up, and back up his methods here. I remember seeing step by step building photos of his doors, and this door, in a woodworking forum. The decision to use plywood with glued on veneer faces was mine, not my mentor's. I debated using solid stock but decided to go with the composite because the panel is only 1-1/8" thick, and I was concerned solid panels only 9/16" thick would warp. The real mistake was using the same thickness veneer as I had on the framing. I did that so I could get to 1-1/8". Lesson learned. I appreciate the offer to help. What I haven't appreciated is the unwarranted criticism of my use of composite construction for the frame when the issue relates to the panels. If you are trying to warn me not to continue to use that approach, fine, show me examples of doors you've built that way that have failed and how a solid wood door in the same situation has survived. I'm interested to learn when facts are presented. The door I mentioned that I would be looking at yesterday is the one shown below. I installed this door early last Summer. It faces due West with no protection at all. The sun hits it in the afternoon, rain hits it when the wind blows. It's a brutal test for an unpainted wood door. When I looked at it yesterday it looked just like in the picture. Here are 2 examples of door failure. We did not build these doors. Contractor brought these in and we made new out of solid mahogany to replace. These doors had been on 10 years or so. These were bad weather exposure at altitude. Stiles and rails were 3/4" fir ply with 1/2" poplar veneer each side. Panels solid 3/4 poplar The one door was TDL 6 lite. We salvaged the IG but the bars just fell out. I think the glass silicon was holding everything together. I cut them apart before throwing them in the dumpster just to examine. Several things were wrong here - Poplar is a bad choice, thick veneer on ply, no means to keep water out of the rail bottoms, applied moulding on outside of door, the doors were pretty much warped and twisted so as not to function. The panels were cut tight to the openings. Joinery was long dowels evidently drilled through the stiles after assembly. You can see where water got in the hardware cutouts starting to work on the veneer and core. I guess these went bad pretty quickly. Hope ours fare better. These probably would have been OK as interior doors other than possible cracks in the thick veneer. I especially do not like stave core thin veneer on doors that might get a lot of moisture. Thanks Joe. The question though was do you have any examples of composite construction doors you made that failed and a solid door worked? Once you start mixing makers I think it's pretty hard to draw conclusions. I doubt you would have built those doors like that. I want to follow up on a comment you made about "I especially do not like thin veneer on stave core doors that will get alot of moisture." or something very similar to that. That leads me to ask what thickness of veneer you prefer on stave core doors? And what do you prefer for the core material? I love to see door failure. Especially when it is not my door. Those two doors illustrate a lot of what passes for doors in the 'custom' market today. Unfortunately, it is an uphill battle for the responsible makers to sell alongside a door that "looks just like the expensive one." Especially when the expensive one does not exist, and cannot be observed over time. I use the pictures of the Alder pair below to show what Alder does in the weather, and a minor (though extremely important) detail about gluing copes thoroughly. Water came up the stiles, and also went down the open cope joints, and the fungus took over. The doors faced west, no overhang. Poor craft in the doors and in the related trades. The company that made these went thru 3 name changes, then closed. They came out of nowhere, got to be huge, shipped all over the country. No one knew anything about wood. The homeowner was so mad when I gave him my pricing, he put in metal doors, not trusting me or anyone. Sidebar: Simpson Door - a successful maker of wood doors and with a pretty fair product once got a contract to make 8' tall full light doors for every Chipotle restaurant in the US. The doors were to be in Douglas Fir and all fixed as a exterior/interior window wall opposite the food prep line. 8 -10 - 12 doors per store. No overhang. Attractive wood went well with the design Chipotle was promoting, and so it was a good fit for all. These were finished"natural" with no stain and clear coats of unknown material. I kept an eye on my local store since I liked the food, and huge portions, and I was curious how often there would be maintenance to the door finish. There was none. I visited often. And within a couple of months, the lower rail and stile joint started to open up a hair line all along the joints - a 9" wide rail - on nearly every door. 2 weeks later (Chipotle and my swearing off of chain restaurants were in conflict...), more of the same. Then the black started. That flaky, dotted black that I'll call mildew for lack of a more accurate term, but we all know what it meant. Then the clear milky and the -what I now think of as - varnish starts to separate from the wood. Then the joints open more, things looking shabbier. The upper rails are going now. The whole row of once nice wood doors is going bad quickly now. I think any day, I'll see the crew out there refinishing, filling with Bondo, bubble gum or worse. But no matter how often I went, nothing but degrade. And I went often. My waistline was also expanding. Damn chain restaurants. Damn self-control. Then it happened - all black aluminum, common as piss, storefront went in one day when I was not looking. No trace of the once nice wood. Now, no telling how the doors would have faired in what I see as a sales success, but a failure to commit to good practice from the shop floor to the end user. Gluing the copes is very important. It will add distinctly to the lives of the doors we make. And I am still trying to loose that weight. When I toured the Morgan Door Factory in Wisconsin, they dowelled all their pine doors together with 5/8" spiraled dowels in 9/16" bores and pressed everything together with huge hydraulic door clamps. No glue on the copes. I asked about this and the guide explained that the glue that squeezes out is very difficult to remove since there are two grain directions at the joint. There also was a risk of gluing doors together since they were stacked directly onto of each there once they came out of the clamp - seconds after being pressed together. I knew about the glue removal, but was taught to use the Red Devil wood handled scraper with sharpened blades. Roy Hart, my 84 yr old coworker that had worked in woodsheds since he was 12, taught me how to use one for glue removal on our little moveable and fixed slat shutter frames we made everyday. I still use one nearly every day, 40 years later. Today, all our copes are well glued, and we do not see failures along that embattled joint. I was looking at the door again. The grain on those panels looks like rotary cut veneer. Adam, if your comment relates to my door the answer is no. It is shop sawn veneer. Bandsaw, drum sander. There is no commercial veneer in my shop. I admit it looks a little odd, but that's wood for you. And here's a picture of the door I looked at yesterday. Somehow the picture didn't post. David, the stile/rail joints are well glued with T-88 epoxy. Squeeze out is easily dealt with with lacquer thinner. So far the door looks perfect. If I can say that 5 years from now I'll be really happy. I fully expect the homeowner will have to refresh the Cetol finish after no more than 2 years. I chose that finish based on the ease of maintenance and it's excellent track record on a couple of adjacent houses. And is anyone talking about he finish on exterior doors? While I have yet to make a stain grade door, I have adopted the practice of using epoxy at all joints, then using a thinned down epoxy to soak into the wood and act as a hardener of the surface, and a preservative, essentially sealing the door to the weather. The doors shown that have failed look for the most part to A: not have had a sufficient first sealing/priming, and B had no upkeep. I wager that David’s doors would eventually succumb to rot, if not properly installed and upkept. Once moisture gets in, everything moves, popping joints, causing swelling and such. That causes paint crack failure. Then, water can get in through the cracks, but is held in be most of the intact paint. Thanks Joe. The question though was do you have any examples of composite construction doors you made that failed and a solid door worked? " Well, we did have one strange case of a stave core Sapele door on a heated detached garage. The door was protected by a good overhang. We got a call from the homeowner mid winter that the door was cracking. The stile was cracked and cupped right at the lockset both inside and out. It was a inswing door with plated hinges which are normally ok here inside because its dry. The hinges were major rusted. Turns out she was pulling her car in full of snow and a overhead unit heater was blowing all the moisture into the door. We were able to re skin the door and flatten the stile without tearing the door apart. These were oil finished so not much protection and we have had issues with Sapele before. We got her sweeping the car off before entering and no issues since. A lot of good custom door companies use stave core - 3-4 mm veneer with no problems. If it is working for you no need to change. We use TB3 for most everything because it is easy. The doors we used to do with stave construction I always noticed a little separation of the skin at the edges. If you use epoxy this should not be a problem. For doors 2 1/4" thick and up I like 3 layer solid wood. This does not work for 1 3/4" thick so don't try that. we do a lot of Euro doors at 68 and 78mm thick hand the 3 layer with no laminations to the weather works well for that. Every job for us is different and decide on stave, 3 layer or solid based on conditions and door type. The second picture is a stave core we did for a 9' historic door that was only 1 3/4" thick. Out of several hundred feet of VG I could not find anything straight enough to go solid. We took flat sawn fir ripped and turned for the core and made sure the skins were same MC. Alternating the grain of the core. The thin doors stayed flat and are protected by a good overhang. The original doors were pretty warped but not bad for 100 years old. The third picture is a section of a barn wood door we did for a restaurant using ply core for the panel. the planks are glued and pressed individually with barn wood splines between. The stile core is LVL made specifically for doors. I prefer solid wood cores but we had some of this and used it. This door is well protected and this panel construction would not be good to the weather. Thanks Joe; lots of good info. in there, from hard won experience I'm sure. Nice to see that others are having good results with 4 mm veneer. I struggle to understand where the optimum skin thickness should be. Some say nothing over 1/8", others that you have to be over 1/8" but then don't say how far over. I know there are always gray areas, but it's surprising that it isn't a well defined parameter after all these years. I'll try my question a different way. Have you seen any composite doors fail that you thought were well constructed and you would not have expected it to fail? It's refreshing to see that you are not whetted to a one size fits all approach construction. Nor am I. A comment by someone else earlier, that you also mentioned, that has greatly influenced me to use stave core construction is the poor quality of most woods today. It is very hard to get straight grained rift or quarter sawn wood thick enough and stable enough to make a door out of. If I can't trust the raw materials I can't use it for something as important as a door. As has been said, wood used to have smaller growth rings and trees were harvested at longer intervals. But that wood is largely gone so you have to adapt your construction techniques to what is available. Others may disagree, but at least you know how I got to where I am. What issues have you had with Sapele? That arched panel door above was made with Sapele. Thanks for your time; much appreciated. And thanks for your comment, Matt. I'm sure the subject of door finishing is as opinionated and argued about as door construction. I personally have a tough time putting paint on a wood door. I guess I'd rather just buy a steel or fiberglass door. But stain/clear coats on a wood door is definitely a durability challenge and I'd be interested in seeing what others are doing. For the few doors I've built I've been using products that the homeowner can maintain - because I don't want to do it but I want to make sure it's relatively easy to do, so they will do it. John - A couple of things. If I saw what I thought was a well constructed composite door fail, I would question my ability to pick out a well constructed composite door. Or, I would just reinforce my prejudice against such things. "What would you expect?" As for what skin thickness is ideal and what are the parameters, I like 1/8" because the planer can plane that thin. It does not feel too thick or too thin. We can also get more skins out of a piece of solid if the are 1/8" than 3/16" or 1/4". The parameters I think are set right here by folks like you and I. By your experience, I am staying thinner that 3/16". I do like 1/16" veneers, so that would be the lower limit. The 1/16" is still durable, able to take a refinish and or repair in the field. It also does not require cross banding to prevent core telegraphing. 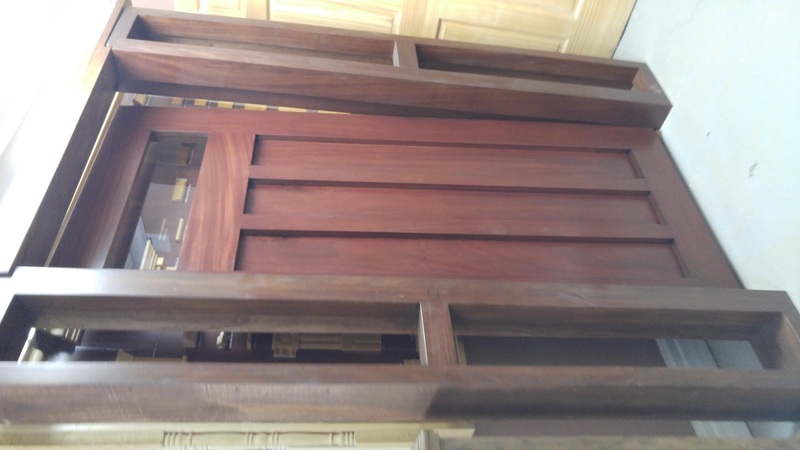 Lastly, your Sapele door is very nice. My questions about your craft have been answered. We also recommend Cetol/Sikkens for most work. 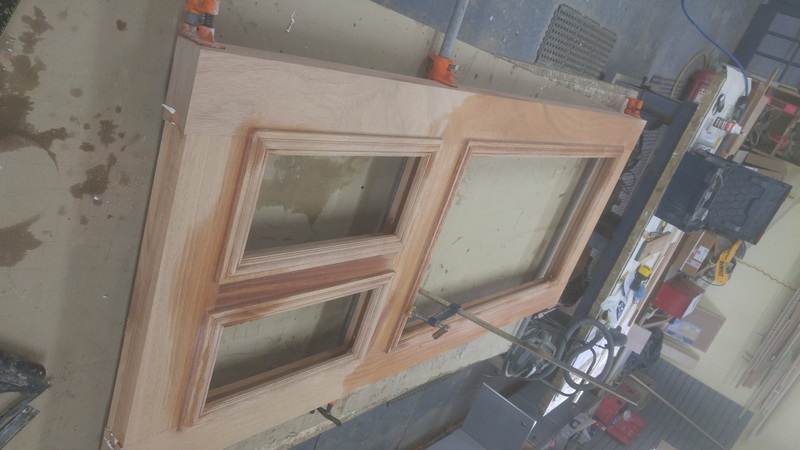 Our finisher has learned how to spray it, glaze it and do some nice things with it, but he still lacquers the interior of the door and frame. The best look and the best durability. The 3 to 4 mm is for visual quality. In Germany the norm veneer for exterior stave core doors is 7mm. We did this for a while but a few people complained about the edge. 3 mm tends to disappear and is fairly substantial. As mentioned we don’t build exterior this way very often. With the fir door we were just trying to get straight 9 ft stiles. When we do stave interior 3 mm finished works well. There are some good shops here that do stave construction. Couple of them are setup with frame saws and big presses. And there are some hacks like the pictures I posted. A lot of the big producers that have warped stave doors I am sure don’t understand facing parts and alternating the grain. You just cannot glue a bunch of wood together and expect it to stay flat. Especially when doors get tall. From my standpoint I use stave where I think I need it. One example is Cherry interior doors. 8/4 cherry makes a great solid stile but tough to get 2 faces without sap. With stave you can do some grain matching. Another example is the job we are doing now out of rustic white oak. This material is only available in 4/4. This would mean stave and skin for 1 3/4 thick, I would probably do 3 layer for 2 1/4 doors with the center core rift or quartered. This job has a lot of 8’ fold slide and lift slide doors 68 mm thick. Normally this would be a 3 layer 5/4 lamination. With the thinner faces we made thicker cores by ripping 8/4 and 6/4 flatsawn and turning it to the quarter - rift grain. The downside of stave construction for the small operator is its labor intensive. We never had much luck outsourcing these. Depending on your location I think there are a few good suppliers of these. We have similar views on current custom doors. In order of construction mostly based on available quality wood: solid , 3 layer 3/4" , same wood stave, then lvl door specific stave. You go down the list and go with what's available. We've never had one problem with 3 layer 3/4" doors. In my 2nd year we made a whole mansions worth of 1 3/4" 2 layer solid cherry interior doors. Those were excellent doors. Not my choice but it worked. 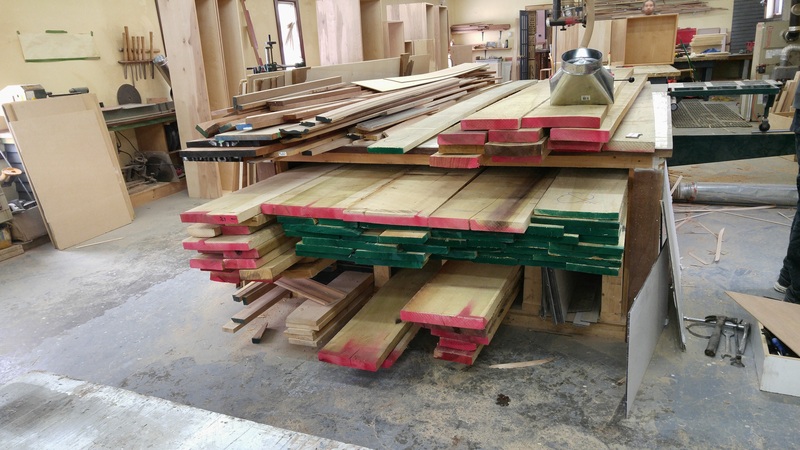 We were a solid door shop at that point and the cherry we could not get enough cherry without sapwood. That was 1996. That section pic of the panel is really unique. Never seen one done that way. What environmental conditions does that door see throughout the year? Thanks for the follow up info., all. The 7 mm used in Germany that you noted, Joe, puts to bed 3/16" (4.75 mm) being too thick. Germans don't often make mistakes and, when they do, they fix it and don't repeat it. My wife is German so I know a few things about them. I tried to find some data as relates to door veneer at FPL but came up with nothing. 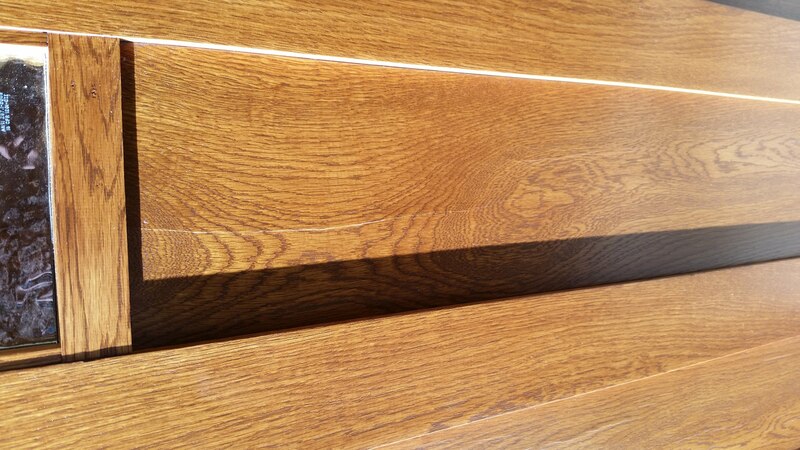 We did 2 layer oak interior doors during the red oak craze of the 70s and early 80s with no issues. Then I did some poplar doors for a commercial building we have and had problems with these. So, probably relates to the material. We did do a 3 layer walnut door job for a victorian house. Walnut is another tough on to get sap free and knot free both sides. The sticking on this job was a deep stopped chamfer and thought the 3mm veneer would look bad on the chamfer. we did 2 - 5/8" faces and a 1/2" core. It worked, but the stiles were not as straight as with a typical stave core thin veneer. The barnwood section in the pictures was out of the weather with a 8' overhang. Would have done different if to the weather. The 7 mm is on a solid wood stave core and that is safe. Check out the link you find some interesting things. They are doing some thick veneer on cross laminated panels. Getting back to the original question, I believe that 3/16" "veneer" is too thick to lay up on plywood or similar wood-like cores. You can apply as thick of a facing as you like to a core that moves at the same rate (stave cores), but my experience inclines me to stay at 1/8" or less for wood facing on a panel that moves little with changes in moisture content. I looked with interest at the "joiner's plates" section in your German link. that show woods surfaces of up to 9mm on plywood and composite cores. I have to assume that the manufacturer feels quite confident in the reliability of their products. What is your feeling about their longevity? I tend to be conservative on this subject, but I am open to persuasion. I note that the species offered are fairly low in movement. Regarding the Owl Door, the commission has faded unfortunately. Typical. Put all the brain time in and nothing happens. The plan was evolving, but I felt pretty good about 1/2" thick H Mahogany faces both sided with a ladder core or a egg crate torsion box core. I could have been wildly delusional. I was distracted by the larger question of 'breaking the rules' as the Owl Door thread evolved. I have direct experience of shop made plywood with thick faces that looks great after 10 years. It is used as exterior door panels. Also, the new 'super' plywood panels that are made of 6/4 softwoods in 3-5-7 plies that are exterior, interior and both. These things are "engineered" in the best sense, and they stay together. Maybe a few cracks are filled, but they would be cosmetic cracks, not structural failure type cracks. Which brings us back to John's panel and his cosmetic cracks. These would be near impossible to fill without it still looking bad. It is not a structural crack, so it appears. A crack thru the panel or thru the plywood core, a delamination (unless the ply faces failed), a failure that does not self explain. Going carefully out on a stout feeling limb, I'll say it is the storm door overheating the faces of the panels. A secondary consideration may be the wild grain of the panel, where straight grain would have fared better. An autopsy may shed some light on this, but my guess it will do nothing to yield a definitive answer. Absolutes are rare in our field. As for Matt's question about exterior doors and the extremes they face- by definition - and how they can stay flat when it is only changes in humidity - moisture content - that causes wood to 'warp'. I think that is good for another thread. This was the type of dialogue I hoped for when I posted this. Thank you. Joe, thanks very much for the link to the German door manufacturer. I have been to that area of Germany at least a dozen times. I've done quite a bit of hiking just South of there, in both Germany and Austria, and it is one of my favorite areas of the world. What purpose do you suppose the aluminum stabilizers serve in those exterior stiles? The name says they are intended to stabilize something, the stile one would assume, but the orientation is wrong to provide any real bending resistance unless it acts like a torsion box. As I said before, Germans aren't ones to do things without good reason and doing their homework so clearly I'm missing how they work; and I'm interested to know. They panels they showed with 9 mm thick veneer got my attention, too. I also noted that they several times said the grain is "plain up to half the rift". One would think rift and quarter sawn would be preferred, but maybe not as I discuss further below. David, I don't believe the cracks go any deeper than the veneer in my door panel. I just finished looking at pictures I took of the other panels and I can see some smaller cracks in them, too. 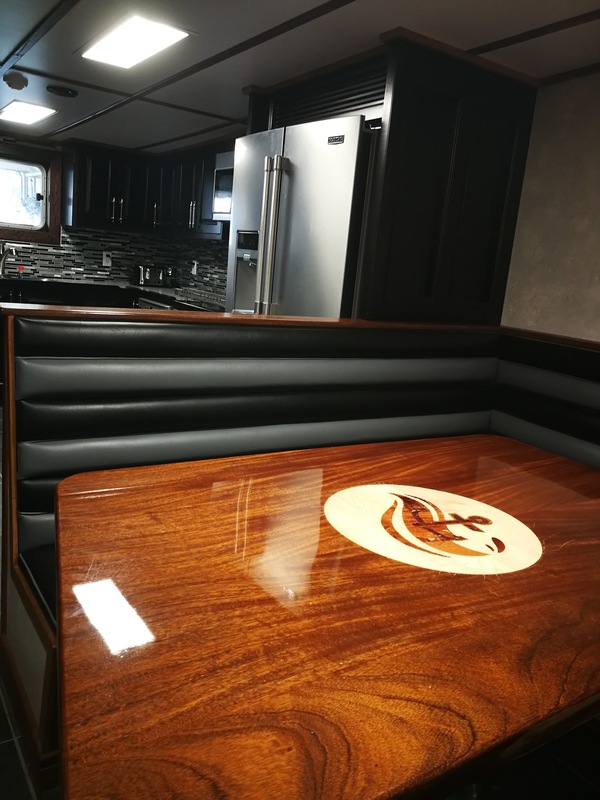 I intentionally used face grain veneer for the panels because the owner likes grain. Bad idea over that plywood substrate, at least it turned out that way with the storm door being there. Anyway, the cracks I can see in the other panels are in the rift sawn areas, not through the plain sawn grain at the center of the panel. I would have thought the maximum stress would be at the center of the panel. Perhaps the plain sawn grain is actually stronger in tension by it's very orientation compared to the rift sawn towards the edges. In any case, that's what I'm seeing. I agree that a seamless repair of the panels is unlikely. As such, I will remove and replace them next Spring. At this point I plan to cut out the panels and then route away the inside edge of the dado that holds them. Some small cross section molding will hold the new two panels, which will be solid wood, independent on the inside and outside. When it's done the outside will be look same, and the inside shouldn't look too much different. If there is a problem with the new panels, at least they will be easy to replace. And I'm going to contact the door people to see if there is a vented option available for it. Is it possible that the solid 9mm material used in the German door parts layups is thermally modified (roasted) wood? My understanding is that TM wood is dimensionally stable (no movement with humidity change) which would allow for full face solid layups on man made cores. The photo does not appear to be the typical roasted look that oak attains. I have been planning to test some TM poplar for yurt doors as a replacement for Western red cedar. I will post when I finally get around to it. They are using the aluminum as the skins in a composite beam. Imagine a aluminum i-beam. Take the center web out and replace it with wood. The real example is a composite panel like fibreglass or carbon skins bonded to a core material like foam or balsa core. Super stiff top to bottom of the stile. In their design of thick aluminum bars continuously bonded to a core of wood it will behave as a metal box section in the width direction of the stile. Likewise super stiff. You could achieve the similar stiffness by substituting an aluminum box section in those stile. It would feel too light to be a door. I've done a ton of composite boat building. We've used many combinations of fibers, metals, plywood and wood. Always glued together with epoxy resin. One of my favorite projects are building rudders for sailboats. We use carbon reinforced, fibre glass skins, vertical grain cedar core. I'm obviously not opposed to all kinds of construction methods. I simply like to start with the simple solid wood and as a last resort switch to a wood composite. If I was to build a large 4' x 12' door I would definitely consider one of the composite constructions. As David mentioned the "engineered" is a coin phrase. The only thing truly engineered in an lvl beam is the calculation of span. Its the application not the material that is engineered. I found this a couple of years ago. The West System epoxy guys were the leaders for a long time. The thick veneered panels are common in Europe as are the reinforced door panels. The wooden door and window industry is highly developed and advanced there. My cousin in Sud Tirol used the 3 layer solid panels in his door and window shop and there was a company in his area that built solid wood kitchens out of that material. I brought some sample panels home and was thinking about importing some but the cost of shipping was just too much. I also noticed a little end cracking after some time. Its so dry here and coming from a wet environment with those might be risky. The Holz Hogger company will be at the Fenesterbau show and I will spend some time in their booth to learn more. Some custom door companies here have been producing thick veneered slab doors with mixed results, There certainly is a market demand for this. I have no answers but believe the type of glue plays a part in this. Also I went down this road a while ago I.
I have a about the worst weather in North America side way rain with salt . I also believe making exterior doors are not voodoo .I started in the 90 's in Montreal restoring old exterior doors most of those doors were white oak .They lasted several decades the one thing they had in common was through mortise and tention with a wedge . Adam, thanks. I get the I-beam comparison. Most of the the load in an I beam is carried by the vertical, center section, not the flanges. Holz Hogger's design still has wood for the center section. I wonder how much they've gained in stiffness with those aluminum "flanges" compared to doing the same thing with wood? I'm sure there must be a benefit or they wouldn't do it, but I still wonder how much of one. If someone told me to use those two aluminum bars, knowing nothing else, I would have glued them in vertically because the Young's modulus of aluminum is at least 5X higher than wood and beam strength is driven by heigth (squared) rather than width. Still, the German's usually get it right so I must be missing something. That was an interesting read about the wind turbine blades. The simple way to explain how a composite panel work is to compare it to an i-beam. I don't like doing it, because people say things like the flanges don't really do much and its the height of the flange that carries the load. That is not correct either. Composite panel like fiberglass/foam works because when you bend the panel it puts one skin in compression and the other in tension. The thickness of the skin increases the strength and stiffness. The thickness of core increases the stiffness by increasing the distance between the skins. We use end grain balsa as a core in boat building. End grain wood is incredibly strong in compression and does not have core shear. They have made a composite beam. Thick aluminum skins with end grain wood core. I looked with interest at the "joiner's plates" section in your German link. that show woods surfaces of up to 9mm on plywood and composite cores. I have to assume that the manufacturer feels quite confident in the reliability of their products. What is your feeling about their longevity? I tend to be conservative on this subject, but I am open to persuasion. I note that the species offered are fairly low in movement. " Hi Kevin, just saw your post. I am conservative this also but these panels have been in use for a long time in Europe. My cousin said he never had issues with them. When you think about it its not much different than the lumber core ply that used to be common here. I will try to find out about the process they use to make these. Adam, thanks for your follow up. I don't disagree. As for the Germans always being right; of course they aren't; no one is. But they are right most of the time, as evidenced by most things they build. And I'll say this in their defense for things you thought were less than brilliant in their cars. If you look at where most all automotive breakthroughs are first commercialized it is in, yes, Germany. The Germans are willing to push the envelop before most others, including the US, and definitely before the Japanese. What makes Japanese cars highly reliable is their extreme aversion to risk and their extensive testing and quality systems. Having worked for over 30 years in the automotive industry, with many trips to most all major manufacturers, I got to see how they work pretty well. When you push the technology envelop you accept the risk of failure. But that's how you move forward, and that's how the Germans get customers to willingly pay big bucks for their newest offerings. This is no different than what I'm reading here about doors. Many folks here wouldn't think of building a composite door, while in Germany it seems most everyone builds that way. I haven't built enough exterior doors to be in a position to judge what's best for me, but I'm interested to learn what people everywhere are doing. So who's got some info. on what the Japanese are doing? Or in Scandinavia? There should be some pretty tough conditions there, like where Kevin is in Quebec. That is a beautiful door, Kevin.
" When you think about it its not much different than the lumber core ply that used to be common here"
The difference as I see it is that the faces on these German panels are far thicker than are typically found on lumber core ply. The core plies, while quite thick, are locked in place with a crossband and the face veneers are much thinner. My understanding is that the thicker the face veneer, the greater the likelihood of face checking as the base of the facing is restrained while the face wants to move with MC changes. I suspect the original poster's problems were due to excessive veneer thickness coupled with the unvented storm door, but there may be other issues. Perhaps the German panels in question survive because they are faced with material that has low movement in service. I think I will keep doing what I have been, but with less certainty. Thanks to all for contributing to another informative discussion. I've been looking more closely at the exterior doors stiles from Holz Hogger. The core between the aluminum bars looks like it's edge grain, just like the full height stave core section. What's really interesting is that on each side of the aluminum bars there is a thin section wood. So you end up with veneer, aluminum, veneer, stave core, veneer, aluminum, veneer, and then all that gets placed between the two skin veneers along with the rest of the core. I wonder what those thin veneer layers on each side of the aluminum are there for. And why don't they make the entire core this way rather than over only about half the width? Cost, or an engineering reason? Here are a couple more links you can drive yourself crazy with. If you are looking at the exterior door styles with the aluminum bar, the bar is placed to allow the deep outside triple rebate that is common on Euro doors. Mainland Europe from Germany down build similar doors and windows with frame parts getting thinner as you go south. The different countries, Belgium and France for example will be similar but with a few things unique to their region. Big focus on energy efficiency everywhere there. The Scandinavian countries have a different system of doors and windows (mostly outswing because of the wind) that is very simple to build. Maybe not quite as energy efficient as the German design but less expensive to build. All these window and door systems are hardware and tooling driven. Thanks Joe. The depth of your knowledge is pretty impressive and I appreciate that you are willing to share it. I think poplar was a lot straighter when I first started woodworking 35 years ago. I don't think it's the wood it used to be.